Die struck and comfort fit. Flat center, milgrain edges and polished finish. Width: 8mm, thickness: 1.8mm. 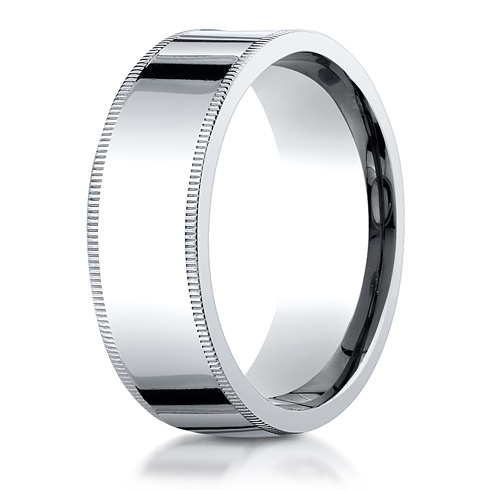 Solid platinum 950 [95% Platinum, 5% Ruthenium alloy] Made in USA. If your ring is ever damaged during normal wear, the manufacturer will repair or replace your wedding ring free of charge. If your finger size ever changes, the manufacturer will resize or replace your ring free of charge. In the case that the manufacturer has to add material to your ring, you will only be charged for the difference in the additional metal or stones needed to restore the piece. The guarantee does not cover rings that have been ordered in the wrong finger size or finger sizes that may have changed between the time of purchase and the actual physical receipt of the piece. Third party alterations, other than engraving, will void the warranty. The manufacturer reserves the right to deny the lifetime guarantee for any ring that shows signs of abuse or tampering.